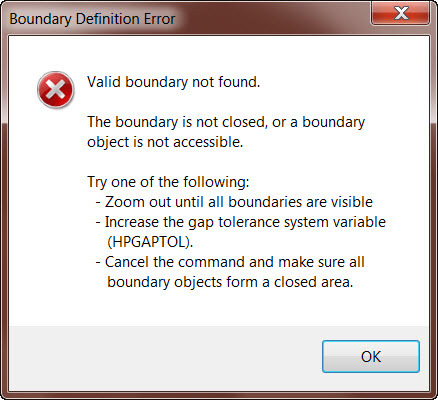 Recently I received a Boundary Definition Error while drafting in AutoCAD. I got the error message when I was trying to hatch the exterior wall of a building that I drafted. I get this error from time to time, and I always cringe a bit, because I know it’s due to a gap in my hatch pattern boundary. Finding the gap is the hard part, hence my cringing. In my recent example mentioned above, the error was telling me that I had a problem with my hatch boundary, which was the exterior building wall I drafted. As the error message stated, there were three ways to troubleshoot the problem. First, I could zoom out until all boundaries were visible. All my boundaries were already visible, so this wasn’t a fix for my situation. And since zooming out wasn’t my fix, that meant I had a gap in my boundary. Secondly, I could find the gap and close it. That’s what I did. Or thirdly, I could have tinkered with the HPGAPTOL system variable, to accommodate the boundary gap. Providing a little info on the HPGAPTOL system variable is the topic of this post. Treats a set of objects that almost enclose an area as a closed hatch boundary. The default value, 0, specifies that the objects enclose the area, with no gaps. Enter a value, in drawing units, from 0 to 5000 to set the maximum size of gaps that can be ignored when the objects serve as a hatch boundary. HPGAPTOL applies only to gaps between lines and arcs that, if extended, would meet. This is need to know info. And here’s an interesting related side note. If you hatch something using an associative hatch, then edit that something, and in doing so create a gap in the hatch boundary, then the hatch pattern will no longer be associative, if HPGAPTOL is set to 0. I think this is a sufficient little overview of this sys var. So that’s all I’ve got for this post. Happy cadding! !